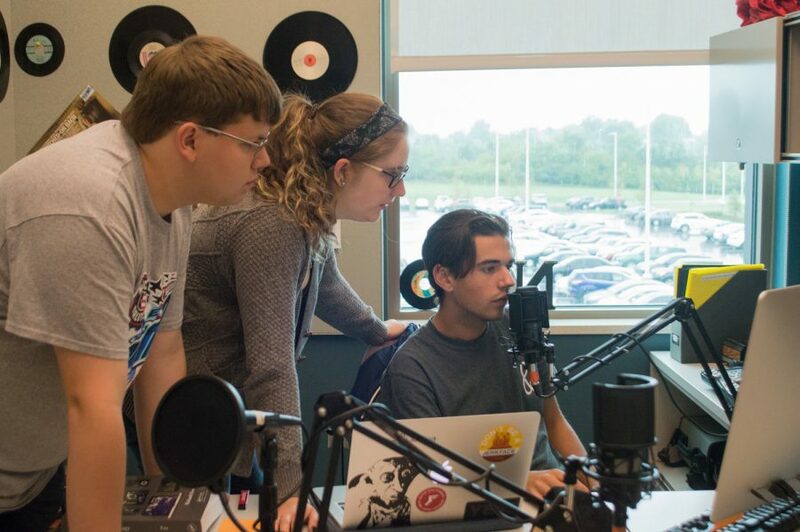 Assistant Manager Alex Gray, General Manager Emily Cay and DJ Nic Vitale record a show in Norse Code Radio's Griffin Hall studio. NKU adult alternative music fans mourned the loss of the beloved WNKU 89.7 FM radio station when it signed off last August. However, this is not the end. Norse Code Radio is an online radio show ran by students and headed by the Northerner’s own adviser Michele Day. The team’s goal is to “become the premiere station for NKU” as assistant manager, Alex Gray stated. Emily Coy, general manager, has high hopes for NCR’s future. “Within the next three to four years, we would like to be able to have a big enough fan base to where we could hold NKU’s own music festival consisting of local and lesser known talent,” Coy said. Both managers emphasized how much they want more people to host a show. “The more air time we can fill, the better. Anyone and everyone is welcome to join,” said Coy. So what can listeners of Norse Code Radio expect? Gray said a little bit of everything. “We have my sports show, Emily’s indie/alternative show, we’ll have movies, politics and more music variety,” Gray said. “I started doing my sports talk show, and I loved it and just kept doing it,” he said. Newcomer Gabe Ludke said he likes discovering new music. The process of running the show is actually quite simple. Music is downloaded from iTunes and then put into a playlist for your own personal show. Then, the music is sent over to the website that is used to broadcast the show. Each broadcast is set up in a small studio on the third floor of Griffin Hall. They also host pre-recorded podcasts. If you have interest in a podcast, Nic Vitale is the one to go to. Norse Code Radio hosts their meetings every Wednesday at 5 p.m. in Griffin Hall 240, all you have to do is show up to the meeting and you may find yourself with your very own show. Right now, you can listen to Gray’s show “Pony Express Sports” on Mondays at 8 p.m. and Coy’s show every Wednesday from 6-7 p.m. at www.norsecoderadio.com.